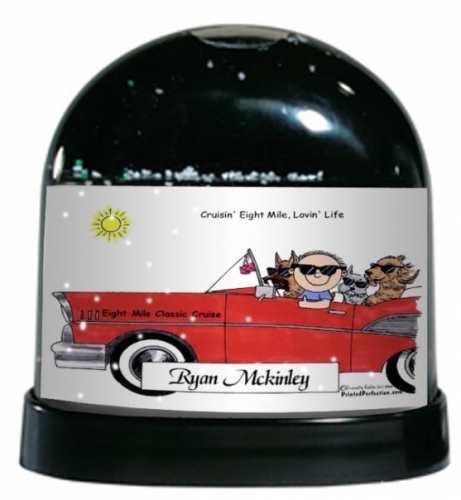 Personalize this car lover (male) cartoon caricature and add it to a snow globe! It's a gift that is sure to please even the hard-to-buy-for! Our snow globes are double sided, made of crystal clear acrylic, which allows you to see your cartoon from either side. It measures approximately 3" x 4-1/2". The cartoon caricature inside the snow globe measures approximately 2" x 2-7/8'; this is about the size of a business card. It comes factory sealed with sterile water and sparkling white snow, adorned with just a hint of glitter. The base is black. We ship our snow globes with a white gift box that is ready to gift wrap!